Nintendo's Rhythm Heaven is the beat-matching Nintendo DS sequel to a Game Boy Advance title that never made it out of Japan—but did somehow manage to get an arcade port. The collection of more than 50 music mini-games is surprisingly deep for a title that relies on two touchscreen mechanics: tapping and flicking. (Okay, there is a tiny bit of rubbing too.) While the word "mini-games" may have become a dirty word to core gamers feeling pushed aside by the tide of short session compilations flooding Nintendo platforms, Rhythm Heaven is a quirky, feel-good medley of gameplay that's simple enough for more casual fans, but challenging enough to appeal to a core sensibility. Rhythm Heaven is already a monster hit in its native Japan. Do we think that you should "tap into the rhythm" and add to the game's multimillion sales? Or does Rhythm Heaven miss a beat? Style: Visually, Rhythm Heaven is loaded with unquantifiable charm. The game's design plays up the strengths of the Nintendo DS hardware, keeping 3D visuals to a minimum, packing the game with cute characters and environments rendered in a simple 2D style. The game's visual variety is not unlike that of the WarioWare series, but feels more homogenized, less intentionally bizarre. Surprising Variety: The Rhythm Heaven developers utilize the Nintendo DS touchscreen controls to a consistently refreshing degree. Despite there being little in the way of complexity to the tap and flick scheme, rarely do two games feel alike. Later games still remain novel in their design, but the rhythmic skills you'll learn throughout make previously completed games much easier. Playing through the medley remixes is a blast. Some Really Catchy Tunes: With the exception of a handful of tracks (see below), the Rhythm Heaven soundtrack rarely offends. In fact, there are a couple of tunes that are infectious, that not only complement mini-games well, but also make previously completed game easy to return to for an attempt at improvement (or perfection). A Lovely Addition To The DS Library: There are few games like Rhythm Heaven for the Nintendo DS. Fans of both iNiS's Osu! Tatakae!! Ouendan and Elite Beat Agents and Nintendo's WarioWare Touch will probably enjoy the smart musical gameplay most, as Rhythm Heaven has a great sense of humor and an off-kilter, but carefully crafted aesthetic. No Restart Option: Rhythm Heaven can be surprisingly difficult, even for music game veterans. Part of that is due to occasionally vague instructions and the fact that the game doesn't do a very good job of explaining what it is you're doing wrong when you fail. The other part is that flicks sometimes don't register as the player intended. Most annoying though, especially when trying to score a "Perfect" rating, is that the game doesn't have a restart option to speed up the action. You'll have to quit the game if you screw up, then wait for the autosave, the loading screen and the practice menu to load. Grating Vocals: There are a couple of tracks in Rhythm Heaven—Fan Club, The Dazzles and Frog Hop— that I never want to hear again. The common thread is that they all have vocal parts that are tough on the ears. The localization on the voiced parts is hilariously bad and will likely offend anyone who has played the import version. Rhythm Heaven is easy to recommend, no matter how you classify yourself as a gamer. While the game has few design and localization quirks, the game features a level of polish that Nintendo is known for, offering a valuable package filled with enjoyable mini-games and post-completion challenges. It's delightful, addictive and can offer a serious challenge. 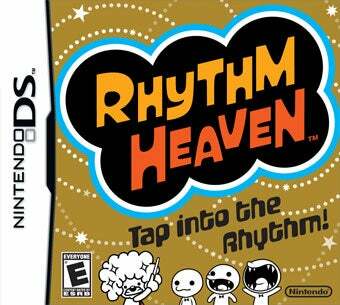 Rhythm Heaven was developed and published by Nintendo for the Nintendo DS, released on April 5th in North America. Retails for $29.99. Completed all mini-games, unlocked about half of the medal games.